If you have an 84-86 GPZ 550 in need of bodywork, you are in luck. Airtech has a street replacement upper that utilizes all your stock mounting hardware and fits the GPZ550 headlight. It is made of lightweight fiberglass and is simple to install. Underneath, you have several options to choose from. We have an optional three piece fairing assembly that bears a resemblance to the GPZ 750 Turbo fairing. It is comprised of a right and left side center section and a one piece belly pan. Using all these pieces will give your GPZ the full fairing look, or you can just use the upper and the belly pan for the plain sport bike look. Whatever your preference, we can take care of you and your two-wheeled baby. 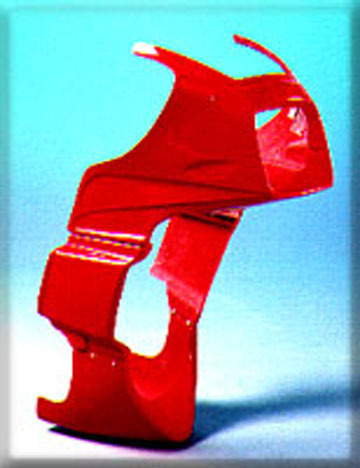 This is an affordable replacement fairing for an unobtainable part. If the fairing on your little 550 is all scratched up, you're probably happy to know that we still make this part. This hand made fiberglass piece is lighter and stronger than the original Kawasaki piece, plus it's repairable! Simply drill the mounting holes, paint it, and then mount onto the chassis and go for a ride. This neat little fairing assembly was designed years ago for the little GPZ550 and GPZ 750. This belly pan and right and left mids complete the look of your little sport bike. Although we stopped making the brackets years ago for these pieces a crafty guy can fabricate them and have this mounted onto his bike before he can finish a six-pack. This side cover does not have the plastic studs on the inside but is dimpled so you can secure it with 3 button head screws.